WWE Fastlane marked the first time Bayley and Sasha Banks would defend their WWE Women’s Tag Team Titles. They had tough opponents in Nia Jax and Tamina Snuka. The Boss n Hug Connection had their work cut out for them, but they emerged victoriously. After the match was over, Nia Jax and Tamina beat down Bayley and Sasha Banks. This post-match beatdown was capped off by Nia Jax launching The Boss over an announce table. 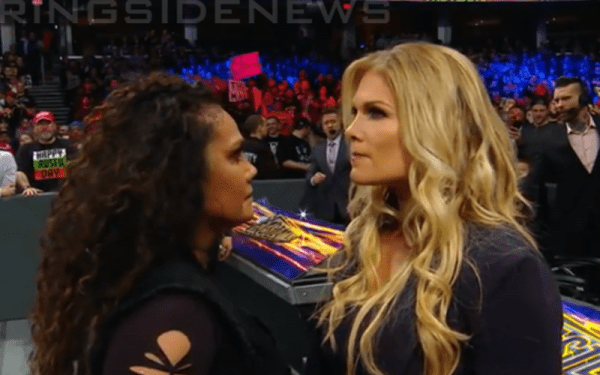 Suddenly, Beth Phoenix who was on commentary stood up to face Tamina Snuka. They had some words and then The Glamazon hit Tamina with a stiff forearm. Nia Jax blindsided Phoenix and then they moved the beatdown into the ring so everyone could get a close look. Natalya ran down for the save, but was unsuccessful. In the end, both Beth Phoenix and Natalya were left beaten on the mat looking on and they were not happy. Phoenix and Nattie were a team as The Divas Of Doom year ago. With the new WWE Women’s Tag Team Titles being a part of the equation now, you never know if WWE was dropping a huge hint for a return of this team. It certainly appeared to be a possiblily after WWE Fastlane.